« Too Heads Or Too Many Cooks? This entry was posted on February 16, 2012 at 1:00 am and is filed under Thursday Tangents. You can follow any responses to this entry through the RSS 2.0 feed. You can leave a response, or trackback from your own site. Hmmm. That’s one of the few Discworld books I haven’t read. I got my highly distorted view of Australia from reading my parents’ Arthur Upfield collection. Oh well. I don’t know Arthur Upfield… Short description, please? Thumbnail sketch of _The Last Continent_ : Rincewind is lost. The wizards go looking. _The Last Continent_ proves up to this onslaught — which, given what either the wizards or Rincewind can do to any place they encounter, is remarkable. There’s also some very thoughtful commentary on the question of creation. And of how ridiculous rain is if you really think about it. And, as a grand finale, one of my absolutely favorite wolf jokes! Upfield wrote a long series of detective novels featuring Detective Inspector Napoleon Bonaparte (known as Bony), a half-caste aborigine. The novels are mostly set in the outback and give a good insight into the lifestyles of the mid twentieth century (Upfield started writing in the 1920s and died in 1964). The books are full of aboriginal lore. They were very popular in Australia and also in England (I read several of them in my teens). If you read the books as strict reportage, they sit somewhat uneasily on modern sensibilities (in one early novel Bony has to fight hard against the attitude that most people don’t regard the killing of an aboriginal as a crime). Upfield was a product of his times and the times were like that. But if you read the books a bit more thoughtfully it seems clear that Upfield does not approve of much of what he writes about. The simple fact that his hero is an aborigine speaks volumes. Since his death, social attitudes have changed a lot. The times aren’t like that any more. I think Upfield would be happy with the change. Certainly couldn’t have said it better. Thanks Alan. My mother still reads Upfield’s “Death of a Lake” when it gets over 105 F in the summer. I think Upfield spent a fair amount of time in the Outback and knew a mixed-race police tracker. That’s the fun part about reading his stories. Think of him as a precursor to Tony Hillerman. Upfield’s books have always been hard to find in the US, although he’s been popular here off and on. If you can find one (say in a library, or a bookstore specializing in mysteries), check it out. Nevil Shute also wrote several books set in Australia – On The Beach and A Town Called Alice are probably the most famous, but there are also several others. I can think of In The Wet and The Rainbow and the Rose off the top of my head. I can heartily recommend his works, whether set in Australia or not. 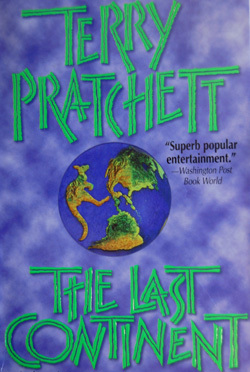 Ah… Pratchett makes an allusion to _In the Wet_ in _The Last Continent_… Another link… Thank you! I thoroughly enjoyed the movie, “The Man from Snowy River,” but never knew the story origin before. Thanks, Alan! It’s one of my favorite pictures (I didn’t care for the sequel as much). “Waltzing Matilda” is certainly incorporated into its musical score. But the first time I ever heard it was when it was incorporated into the score of the screen version of “On the Beach” in the late ’50s, based on the Nevil Shute book that Roger Ritter cited. If “Waltzing Matilda” makes you cry, do not ever listen to “And the Band Played Waltzing Matilda” which is about the Battle of Gallipoli in 1915. This battle, commemorated on ANZAC day, is of significance in both NZ and Oz. Wikipedia has an entry on the song if you are interested. I learned about the battle of Gallipoli in college. I remember walking out of the lecture with the combined feeling a deep grief for a bunch of young men I never knew and confusion that such things could happen… That’s one reason the song can make me weep.